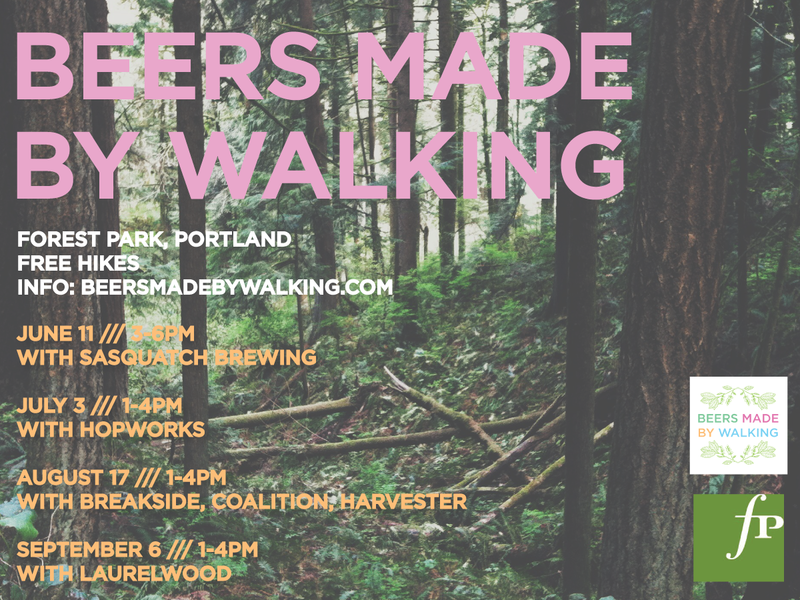 Beers Made By Walking, the program that invites breweries to make new beer inspired by nature walks, is collaborating with the Forest Park Conservancy in Portland, Oregon, to offer a series of local hikes throughout the summer and fall. Led by Forest Park Conservancy's Matt Wagoner and local brewers, these hikes will focus on edible and medicinal plants and inspire a series of beers that will serve as drinkable, landscape portraits of Forest Park and the surrounding area. Hikes are free, but registration is required. Tickets will become available approximately a week before each hike. You can follow the Facebook Event Page for Beers Made By Walking Hikes to receive updates about the program. Location and directions will be sent to registered guests. June 11 - Newton to WaterlineThis hike will showcase the the heart of Forest Park, where the forest transitions from its more frequently visited urban side to the quiet solitude of the north end of the park. Hikers will get to see the contrast between the impacts of invasive species and the remnants of mature Doug Fir forests that once covered the west hills. July 03 / Ancient Forest PreserveEmbark on a Beer Walk through the towering trees of Forest Park Conservancy's Ancient Forest Preserve. This hike will focus on old growth forest characteristics, edible/medicinal plants, and how plants are used to make beer. Along the way, learn how wild yeast was harvested for brewing a unique beer for the Beers Made By Walking program. Where: A 20 minute drive from downtown Portland, north of Forest Park. Tickets: Tickets will become available here on Thurs. June 26th. August 17 / Cascade ViewsA hike that showcases a variety of terrain in Forest Park, from open shrubland to cool creek valleys. Part of the Beers Made by Walking Program, this hike will focus on edible/medicinal plants and their application in beer making. Hikers will join brewers from three Portland breweries as they explore summer vegetation. Tickets: Tickets will become available here on Fri. August 8th. September 06 / Wildwood North This event will lead hikers along the northern end of Forest Park’s iconic Wildwood Trail. One of the more ecologically healthy areas of Forest Park, hikers will see a wide variety of edible/medicinal plants here and learn how brewers use them to make beer. Tickets: Tickets will become available here on Fri. August 29th. The Mission of the Forest Park Conservancy is to protect and foster the ecological health of Forest Park, maintain and enhance the park’s extensive trails network, and inspire community appreciation and future stewardship of this iconic urban forest as a gift for generations. The Conservancy fulfills this mission with a staff of seven full-time employees, several seasonal part-time conservation technicians, and more than 1,000 volunteers each year. We operate under a formal partnership agreement with the City of Portland Bureau of Parks & Recreation, the owner and manager of Forest Park. Beers Made By Walking is a program that invites people to step outside and see the place they live in a new light. We invite brewers to take nature walks and make beer inspired by the plants identified on the trail. Since 2011, we have worked with over 45 breweries in Oregon, Colorado, and Washington. Our hiking and tasting events act as educational and fundraising programs for environmental organizations in the regions we serve.